Following on from last week’s featured Free Audio Friday title, Rebecca West’s The Return of the Soldier, Elizabeth is offering another audiobook that helps to commemorate the beginning of World War I: Edith Wharton’s memoir Fighting France. 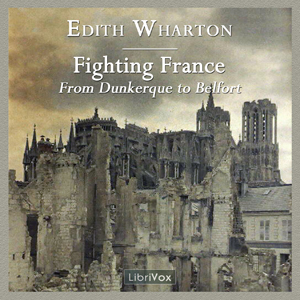 This is Elizabeth’s solo recording for LibriVox, and is one of many Wharton books that she has recorded; take a look at the Credits page to see the full list. Wharton was an American writer (and is well known for her novels The Age of Innocence and The House of Mirth), but spent a good portion of her adult life in France. When the war started in 1914, she obtained permission to visit sites behind the lines, including hospitals, ravaged villages, and trenches. Fighting France records her experiences traveling across the country in the first two years of the war, and celebrates the bravery and spirit of the French people. Highly recommended!